What would your home be worth, if we marketed it like crazy in today's market? You may be surprised by its value, in a good way. After dropping every year for 6 years between 2005 and 2011, Placer County median home prices hit bottom and shot back up 18.6% in 2012 and then another 19.3% in 2013, 11% in 2014, and continues to rise now. While prices are still quite a ways off from where they were at the peak in August 2005, they have improved quite a bit over the past few years. If you would like to find out what your home is worth in today's market conditions, fill out the form below. 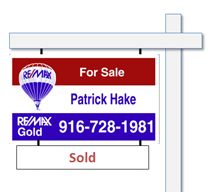 Patrick Hake the Placer County Homes and Land Team leader and listing specialist, will contact you to disucss your property over the phone and arrange a time to do a visual inspection. Once he has had a chance to meet with you to view your property, he will use what he has learned and what you have told him about the property in combination with recent sales in the area to estimate the maximum current selling price for your home. Both how you price your home and how we market it will have major impacts on whether you receive the highest value for your property and whether your home sells at all. If after meeting with Patrick and receiving your market analysis you decide that it is a good time to sell, Patrick can then arrange a time to meet with you to discuss how we can help you sell your home. If you decide that now is not the right time, we will stay in touch and be ready to help you when you are ready.